The Nigerian Navy, Central Naval Command, has arrested nine Nigerians and three Ghanaians on board a vessel laden with crude oil suspected to have been stolen from Akassa community in Brass Local Government Area of Bayelsa State. The suspects were arrested on Friday by operatives of the Forward Operating Base of the Navy, known as FORMOSO, offshore Nun River on board MT FRANKENSEN, allegedly loaded with over 1,092,000 litres of stolen crude oil. On Saturday, the Flag Officer Commanding, Central Naval Command, Rear Admiral Sidi-Ali Usman, in company with Command Operations Officer, CNC, Commodore Emmanuel Enemor; Commanding Officer, FORMOSO, Capt. 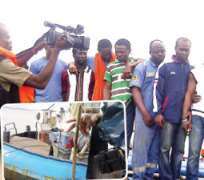 Aniedi Ibok; Commander Samuel Garba, among others, visited the arrested vessel. Usman told PUNCH Metro that the vessel was headed for Tema in Ghana, where the product was expected to be disposed of. He said, 'Upon interrogation, the captain of the vessel, Adeyemi Akinleye, confessed on video that they were instructed by the owner of the vessel known as Mr. John George, residing in Port Harcourt, Rivers State, to load stolen crude oil from two barges around Akassa and thereafter proceed to Tema in Ghana where the product would be disposed of. 'The captain, giving further details of their mission, revealed that a local pilot was used to navigate the vessel into Nun River while one Mr. Destiny was the agent that supplied the product. Usman said the vessel, which measured 83 metres length and eight metres breadth had a tonnage capacity of 1,200 metric tones. He said preliminary investigation showed at the time of arrest that the vessel could not tender relevant documents and permits required for the movement of petroleum products through Nigerian waters. He added that the vessel's movement log showed evidence of previous voyages to Ghana. 'It seems reasonable therefore to infer that this is not the first attempt by the owner of the vessel to steal crude oil in Nigeria for the purpose of selling in Ghana,' he said. Usman reiterated the determination of the command under his watch to completely eradicate the menace of oil theft, illegal bunkering and other forms of criminalities in the command's area of responsibility.